A woman of the Calliope or Clio type, facing slightly to dexter, her face framed by ringlets shrouded in a scarf attached by a circular clasp at the front, the whole encircled by a fillet. Translation of inscription: Antonio Canova made this gladly for William Hamilton, a man of distinction and a friend, in acknowledgement of his exceptional goodwill to himself and of his patronage in the recovery of artistic monuments from France. 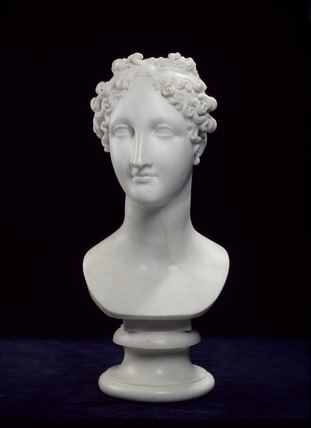 Executed by the foremost exponent of the Neo-Classical ideal in Europe, this bust was one of four Ideal Heads presented by Canova as an expression of gratitude to members of the British delegation to the Treaty of Paris, captured at the fall of Napoleon in 1815. William Richard Hamilton, to whom this bust is dedicated, was the Englishman most responsible for the success of Canova's mission. Canova had been sent to Paris by the Pope, Pius VII, to claim the works of art removed from Italy by Napoleon. It is of a type of Canova's work known sometimes as Clio, the Muse of History and sometimes Calliope, the Muse of Epic Poetry.